Input of new products form from supplying companies. When you receive new components in your store from your supplier, on this page you should enter amounts for each component. 4. Set the item price and you will see sum for each product. � To activate bar code reader, press F10 and use bar code reader to read component bar code. Component with specified bar code will be selected. � On the right side will be also total sum of all products. � If you have entered wrong amount, and you want to change it, just click on item in list, enter correct amount and press 'Change' button, or if you want to delete it press 'Delete' button. � Don't forget to press 'Save' button when you finish. 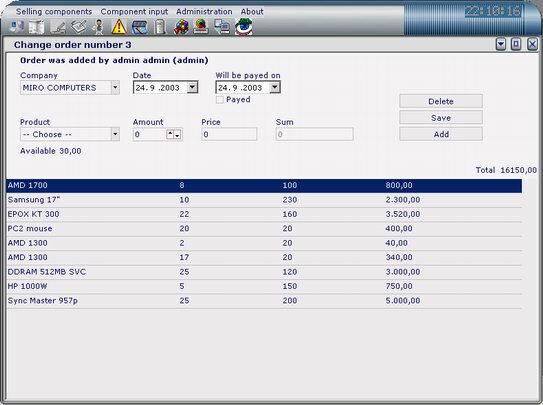 � You can PRINT list if you needed it for administration.